private-webmention is a suggested protocol for combining microformats2, Webmention, and IndieAuth to convey private posts between two people or between groups of people. Note: This is a draft spec, feel free to leave notes or comments inline, or share your thoughts on your own site and link to this page. In the response body, it SHOULD display a human-readable IndieAuth login screen. Bob then needs to prove to Alice he really is the intended recipient. This is where IndieAuth comes in. Note: there is an obvious advantage to having Alice indicate that this webmention will require authentication in order to verify, since that saves an HTTP request. Is there some additional parameter that could be sent in the initial webmention request indicating that authentication will be required? Bob's webmention endpoint uses Bob's authorization endpoint to generate an authorization code (this is implementation-specific, but could also follow a spec so that the authorization endpoints are interchangeable). For now, we will assume there is a pre-established relationship between Bob's webmention endpoint and authorization code where a code can be obtained. Bob's webmention endpoint sends the authorization code to Alice's token endpoint requesting an access token. Bob's webmention endpoint discovers Alice's token endpoint by looking for a rel=token_endpoint link on Alice's home page. 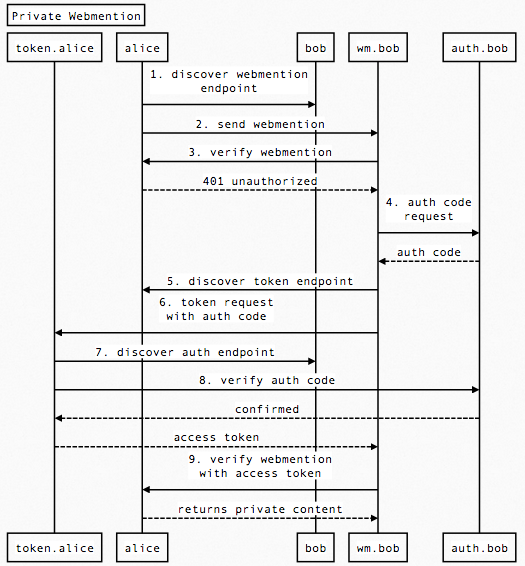 Alice's token endpoint verifies the authorization code against Bob's authorization endpoint and responds with an access token. Alice's token endpoint discovers Bob's authorization endpoint by looking for a rel=authorization_endpoint link on Bob's home page, which was indicated in the me parameter of this request. Alice's token endpoint then makes a request to Bob's authorization endpoint to verify the authorization code. If the authorization code is valid, Bob's authorization endpoint responds with success, and indicates the user the code corresponds to. Alice's token endpoint verifies that the authorization server responded with "https://bob.example.org/" and then generates an access token for Bob, and responds. Bob re-fetches the original URL with the access token that Alice's token endpoint generated. Alice's server verifies the token and responds with the private content. (Alice's server can either verify the token directly if her server and token endpoint share a database, otherwise this may happen via an HTTP request as described on tokens.indieauth.com. Bob's server looks for the target URL as a normal webmention verification would do. This is similar to how Bob would sign in to Alice's website if he were using a browser. Bob's webmention endpoint needs to be able to generate an authorization code that can be verified by Bob's authorization endpoint. This means there needs to be a pre-established trust relationship between Bob's webmention endpoint and authorization endpoint. The protocol between the two endpoints does not need to be standardized, but there is an advantage to doing so, which is that Bob would be able to use a different authorization endpoint without any code change. We can achieve threaded conversations by using the in-reply-to markup just like we do with public comments. If Bob wants to reply back to Alice, he just makes a new private post and adds <a href="https://alice.example.com/message/1" class="u-in-reply-to">https://alice.example.com/message/1</a>. Given this markup, it's left to the UI of the system displaying the message to display the messages in conversation order. We can also extend this idea to sharing private messages with a group of people. All Alice would have to do is link to multiple peoples' URLs in the post and send webmentions to each server. Then when any of the three people verify the webmention, they will see their URL in the page and can accept the message. If Alice does not want to reveal the entire recipient list to everyone (like a BCC email) the server could just hide all other recipients other than the authenticating user. Static sites cannot perform dynamic authentication and can't return different responses given the validation of a token. However, if you're willing to accept security by obscurity (such as using a 128-bit random identifier in the URL) then you can still send private webmentions with a static site! Since a static site server can't choose to respond to a request with HTTP 401, it would be unable to send the initial HTTP 401 response. However, if the message lives at a sufficiently obscure URL, this may be ok anyway. In this case, Alice would create a new html file named something like https://alice.example.com/message/74809250de2401300d0714109feae54c.html (or https://alice.example.com/message/73ZE9ngcTj4LUCUUjQQ8j8.html for equivalent randomness if you're using the NewBase60 charset). When Alice sends a webmention to bob.example.org, Bob's server would then go fetch that URL and would immediately get the HTML reply, and IndieAuth would not be required. If this is an acceptable trade-off (security by obscurity rather than using IndieAuth) then the protocol should work just as well, with no additional work needed on Bob's end! However, there should be some indication that this post was shared explicitly with Bob, so that Bob knows not to publicize the URL. An alternative would be to have an Apache or nginx module that can handle the IndieAuth HTTP authorization. Given an Apache module such as mod_authn_indie it could handle sending the 401 reply and verifying the request given a token. Of course this wouldn't work in environments where you don't have access to the actual web server software, such as Github Pages or many shared hosting environments. Can the initial webmention include a flag that says "this post is going to require authentication, come back with an IndieAuth code"
Can't you just always send an IndieAuth authorization code with every request? Especially sending it to all requests your server makes to your own whitelist. We could add a 'recipients' to micropub (maybe as a space-delimited list), where a micropub server that supports this would default to 'only me', and the user can later log in to change the audience of posts that were made by a micropub client that does not support this feature. A public post could have 'recipients=public'. A feed could include only public posts by default, but include group- and private posts when retrieved with an IndieAuth token (for feed readers that don't support sending the IndieAuth Authorization headers described here, we could also allow the token to be passed as a query parameter in the feed URL, as well as in the entry URLs the feed links to). This protocol means any server can now receive a webmention to https://domain.com/ which are initiations of private messaging threads, and not meant to be displayed as an entry in a public comments section. So maybe a simple solution: only display comments on specific post URLs, not on your main home page. This protocol is a hack that uses linked-to notifications to convey new messages which don't really have anything to do with the linked page. This protocol completely leaves out readers which will not see the message in the normal message stream. If a reply context is fetched from a private post (assuming the post is pulled by the server automatically sending its auth key). How do we specify that the post is private? The reply might not be private and thus the reply context would show a private post publicly. Perhaps an extension to mf2 to denote sections as privledged information, do not share publicly. Nothing about the message is revealed from the UI without signing in. The only things that an unauthenticated viewer can guess at are from the URL. To: who the message was sent to (thus which domains to try signing in with). Contents: the contents of the message, whether they are text, or hyperlinks, or anything else. This page was last edited on 25 September 2016, at 03:57.